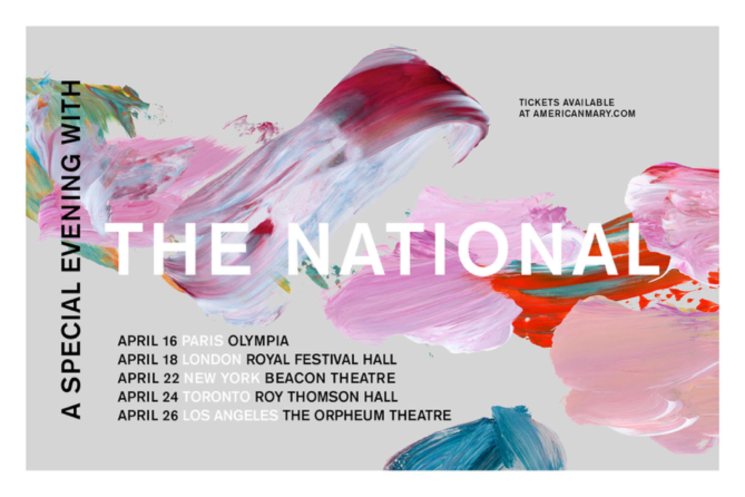 The National have announced a string of upcoming shows that will see them playing intimate venues under the banner "A Special Evening with the National." The band will play five concerts, hosting events in Paris, London, New York, Toronto and Los Angeles in April. Their Toronto show will take place at Roy Thomson Hall on April 24. Tickets for the Toronto, New York and Los Angeles shows go on sale Friday (March 2) at 10 a.m. local time. Tickets for the Paris and London shows will be available on March 4 at 10 a.m. local time. Additional details are expected to be announced in the coming weeks. For now, see the list of upcoming performances below. The National's most recent album, Sleep Well Beast, was released in 2017.